Say hello to Moya! 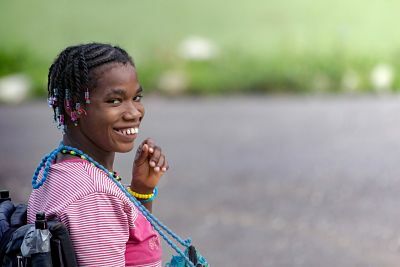 She is a resident of MSC Jamaica at Blessed Assurance, our apostolate near Montego Bay. This picture encompasses so much of her unique personality. Although Moya cannot hear or speak, you won't find it hard to know what's on her mind. She has a gorgeous smile and contagious laughter to share with everyone. She loves crafts, especially if they include stickers and crosses! Thank you for sharing your smile with us every day, Moya.